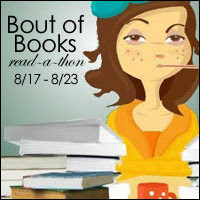 Bout of Books is an annual, low pressure read-a-thon created by Amanda @ On A Book Bender. Everyday there are different challenges and giveaways hosted on different book blogs to check out as well. I'm trying not to be over-ambitious, keeping my TBR list to just four books. Hopefully I can manage to finish them all, considering three aren't that very long and the fourth being something I can take over to the next week if I don't manage to finish it. Keep an eye out for updates along the way as well as see if I manage to finish the read-a-thon! I'll definitely check out your list, thanks for stopping by!